“It’s fun to tell the story, because it’s one of those things that just happened”, Loni Rose says when asked about how King’s Bullet (her partnership with hit songwriter and producer, Trey Bruce) came to be. Loni originally met Trey through a mutual friend to do some songwriting together, but the pair quickly realized that what they had was something extra special. 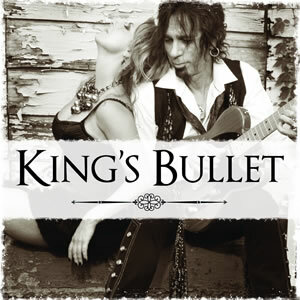 The result is the debut EP of King’s Bullet; eight songs shot straight from the heart. From the opening lines of the eccentrically titled “Watermelon Sun” to the rawness and energy of songs like “One Brick Shy”, “Blood On the Floor” and the title track, the power of their partnership is on full display. I had the chance to speak with Loni about the new album and her partnership with Trey. We also discuss her musical background as well as the day she had an epiphany, and discovered the real secret of songwriting. goJimmygo (gJg): Tell me about the genesis of King’s Bullet. Loni Rose (LR): Trey and I met a few years ago in Nashville by a mutual friend (Eli Ball) just to meet and possibly do some writing together. One of the things Eli had told me before I moved to Nashville and started co-writing was, “You’re going to meet and write with a lot of people. There will be situations where you will really click, and then there will be times when you don’t. But every once in a while, and maybe only once, you’re going to meet someone and there’s going to be magical chemistry.” And that’s what happened with us. I’ve been a solo artist for a long time and Trey’s always been a hit writer and producer. So this is a major thing for both of us. It’s cool! gJg: What were those early writing sessions like? gJg: That’s one of my favorite songs from the record! LR: I was going through some things when I showed up at the co-write and that was kind of how that song was born. Trey and I discovered as we got to know each other that we both had gone through a lot of things in love and life that were similar. We both channeled that feeling and got really raw about it; which was new for me. I was always more comfortable with writing music that lifts and lights up a room. I wasn’t used to writing songs that had a darker edge or a tragic, sad quality to them. It wasn’t easy for me to get comfortable about talking and writing about it. That has been a huge evolution for me. LR: It was Eli Ball who once said, “When you guys write together, you leave your blood on the floor!” I immediately texted Trey and said, “This is our next song title!” [laughs]. We actually wrote “Blood On The Floor” the day before we went in to the studio to cut the EP. gJg: Tell me a little about your musical background. LR: My parents both played guitar and I grew up listening to them play in the house. When I was in third grade, I started taking piano lessons and got really into it. There actually came a point where I really got lost in playing. I would practice my piano in the morning, but then when I came home from school, I’d just play and make things up. I remember that even before I had actually written a “real” song with lyrics, I had about fifty or so pieces of music that I created and would just play for hours. It wasn’t until I was in a piano room in my high school trying to write a song with words that I finally realized where they come from. Songs come from inside of your heart, inside of you. It was a place to be expressive. Ever since that clicked in my head and I wrote that first song with lyrics and melody, I was able to write, and I’ve been writing ever since. I’ve been fortunate to have had a lot of my music placed in TV and film. It’s given me nice exposure which helped when I moved to Nashville. gJg: Now that the album has been released, what’s next for King’s Bullet? LR: We’re definitely interested in going out on tour and supporting the new record. We’re on this amazing ride and have no idea where it’s going to go. It came from such an authentic place, and we’re having so much fun just throwing it at the world and seeing what’s going to happen next. Article first published as Women Who Rock: Loni Rose of King’s Bullet on Technorati.